I’ve made a lot of recipes from All About Braising : silky braised endive with prosciutto and cream-bathed Brussels sprouts, Zinfandel-braised pot roast and sticky Vietnamese scallops, 7-hour leg of lamb and even a leek and bacon tart, plus many more. Ever since I bought the book, I’ve had my eye on a recipe for braised chicken with pears and rosemary that sounded divine, but inevitably, every fall I fail to have the ingredients on hand simultaneously. Was I subconsciously sabotaging myself out of concerns that this recipe I’ve been salivating over for years might actually produce a plateful of mush—boiled chicken, soggy pears? Well, no matter, because this year Jeremy bought chickens when I had a sackful of juicy red Bartlett pears in the refrigerator, and I knew instantly what we would be having for dinner. The recipe mostly follows your standard braising procedure. After drying, seasoning, and stuffing my chicken with pear and rosemary, I trussed it up (very neatly, as I had just seen Anne Burrell trussing chickens on television a few days before; that woman’s hair and mannerisms may give me the heebie-jeebies, but she really knows how to handle meat) and seared it all around in my oval Dutch oven. Then you sauté your aromatics, add some cooking liquid—surprisingly very little, in this case—and nestle the bird down in there to cook slowly in the oven for a little over an hour. Meanwhile, you channel Anne Burrell yet again and make uber-creamy garlic mashed potatoes using that food mill that you only rediscovered a few days ago. Hubby-power is useful here, because you also need to caramelize some more pears with rosemary and balsamic. The chicken is done when you get ready to carve it and it practically falls apart; somehow this fact didn’t stop me from being paranoid that the thighs might possibly be undercooked. A little drizzle of jus over the lot and we ate well—an early ode to fall on a plate. Now you may be thinking that my photo of the chicken is kind of pale and sad, and could have used a sprig of fresh green rosemary to spruce it up—and I would agree with you. 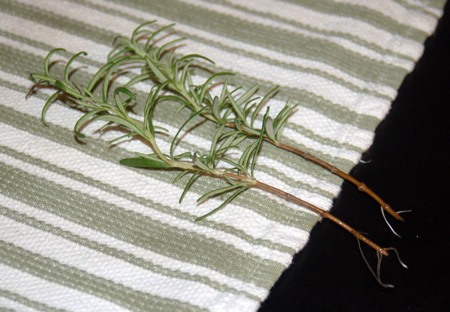 But as you can see, my rosemary was busy with another project: ensuring that I will have fresh rosemary to make this meal again next fall! Preheat the oven to 300F. Rinse the chicken inside and out, and pat it dry. Remove any large chunks of fat around the neck and thighs. Remove the last two joints of each wing, by cracking the joint and then using a sharp knife or very strong kitchen scissors; reserve these, along with the neck and giblets (except liver). Season both the inside and outside of the chicken with salt and pepper. Quarter the pear and stuff it inside the chicken cavity, along with two rosemary sprigs. The easiest way to do this is by putting two quarters in stem side first and two quarters blossom side first. Truss the chicken with about 2 feet of kitchen string: With the breast-side up and the drumsticks facing away from you, loop the string under the ends of the drumsticks and cross it to form an X over top of them, then bring your hands down so that the X drops between the two drumsticks; pull this tight and bring the string forward around the sides of the chicken, pinning the wings against its sides. Then tie a tight knot under the chicken’s neck, making yourself a neat little package for searing. Trim off any excess string. Heat 1 tablespoon of oil and 2 tablespoons of butter in a Dutch oven over medium-high heat. Pat the chicken dry again and lay it breast side down in the hot pan. Brown the chicken for at least 3-4 minutes and then gently lift it up to see if it’s browned. If not, let it go another few minutes. You’ll want to carefully turn the chicken so that it browns on all sides. Molly recommends the use of two wooden spoons, and I found this more effective than tongs for gentle maneuvering. Once the chicken is completely browned, remove it carefully to a plate. Add any chicken pieces (such as gizzards, heart, neck, and those wing tips you cut off) to the pan and saute them until browned, about 7-10 minutes. Remove those to the plate as well. Drain the pan of all fat. Don’t scrape it though, you want to leave all those good caramelized bits. Turn the heat down to medium and add a tablespoon of butter. Now add the leek, shallots, and last rosemary sprig, along with some salt and pepper. Cook for about 7-10 minutes, or until the vegetables are soft. Add the wine, turn the heat up to medium-high, and boil for 2 minutes. Add the stock and boil for an additional 2 minutes. Carefully set the chicken on top of the veggies, and cover the dish with parchment paper. Cover tightly and slide into the oven. Molly calls for basting every 20 minutes, but I am lazy and just trusted the braising to do its thing without me releasing the pot’s moisture four times. After about an hour and twenty minutes, the chicken should be very moist and registering 170F between the breast and thigh on a thermometer. 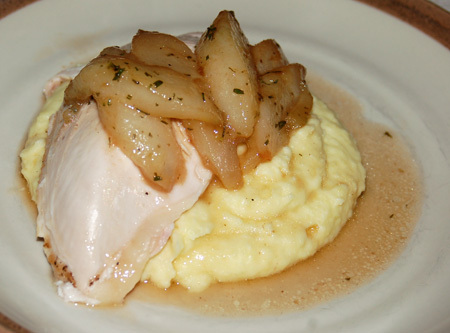 When the chicken is just about done, peel the last two pears, core them, and slice them into 1/2 inch thick slices. Mince the rosemary and set aside. Heat 2 tablespoons of butter over high heat in a large, nonstick skillet. Once the butter stops foaming, add the pears and toss to coat. Add the sugar, rosemary, salt, and pepper. Cook, stirring and turning the pears frequently, until the pears have started to caramelize. Add the balsamic vinegar and cook for another 30 seconds. The balsamic vinegar will form a glaze that quickly thickens. Pull the chicken out of the oven. Using those same wooden spoons (my tongs worked just fine here), tip the chicken so any juices inside the cavity run back into the Dutch oven. Set the chicken on a cutting board and cover with foil for a few minutes. Meanwhile, strain out the vegetables and other chicken parts (wings, heart, etc) from the pan, keeping all of the juices. I find this easiest to manage by just setting my sieve over a small saucepan and going from there. Boil the juices over high heat for 5 minutes, stirring frequently, to thicken. Carve up the chicken. Anchor it to the plate with a big dollop of creamy mashed potatoes if you like, then top it with glazed pears and a spoonful of the pan juices. Source: All About Braising , by Molly Stevens. This looks delicious! I love new chicken recipes…especially ones that involve fruit 🙂 Thanks!